This summer, Alison Knowles is making a salad—and she needs your help. The legendary performance artist will be performing her seminal Make A Salad (1962) at Art Basel. However this is no ordinary meal. 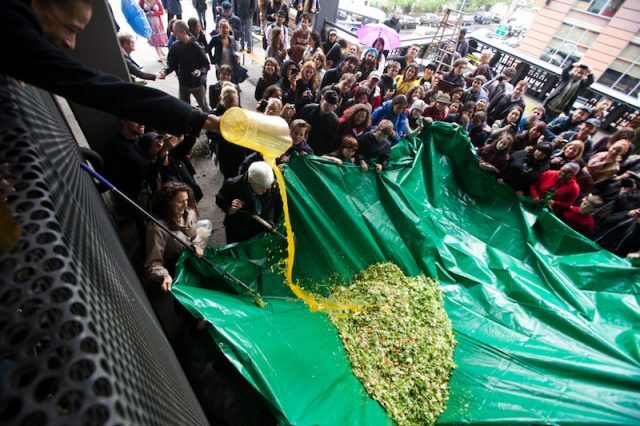 Performers will prepare various salad ingredients before emptying the contents onto a large tarp. Fair visitors and onlookers can participate by helping to toss the salad high into the air, before it is served. The 82-year-old artist’s work will be performed in “Unlimited,” a platform which gives galleries and artists to display works that transcend the traditional art fair stand, such as large-scale sculptures, video projections, installations, or performance art. Gianni Jetzer, a curator-at-large for the Hirshhorn Museum in Washington DC, is curating “Unlimited” for the fifth consecutive year.